Alfalfa is a plant which sends its roots down twenty to thirty feet into the ground and brings up the minerals that are not available on the surface. For this reason, the Arabic word Alfalfa means "father of plants". Alfalfa is rich in vitamins, minerals and other nutrients that play a vital role in the strength and growth of our bones and in the maintenance of a healthy body. It contains protein and vitamin A, vitamin B1, vitamin B6, vitamin C, vitamin E, and vitamin K. It also contains calcium, potassium, carotene, iron, and zinc. It can be taken in the form of seeds, leaves or tablets. What are the Benefits of Alfalfa? Curing kidney problems, and relieving fluid retention and swelling. Nourishing the digestive, skeletal, glandular and urinary system. Cleansing the blood, liver and bowel. Since alfalfa is very rich in minerals needed for the formation and strengthening of bones, a tea made from alfalfa (especially from its seeds) has shown beneficial results in the treatment of arthritis. 2Alfalfa is known to reduce blood sugar levels, and is therefore considered a natural treatment for diabetes. Vitamins A, C, E and Zinc are proven to help dissolve kidney stones. 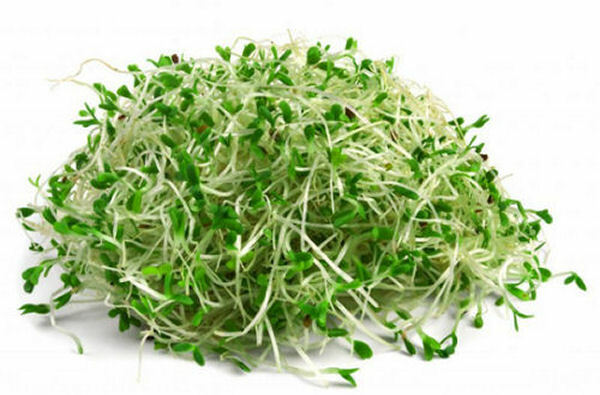 You can find these vitamins and minerals in Alfalfa powder and Alfalfa sprouts. The juice of alfalfa, in combination with equal amounts of carrot and lettuce juice, taken daily, assists in the growth of hair to an amazing extent. The combination of these juices is rich in elements which are especially helpful for the growth of hair and the prevention of hair loss. What are the Side Effects of Alfalfa? As with all herbal products, moderation is the key to avoiding adverse reactions. For example, excessive consumption of alfalfa may cause the breakdown of red blood cells, which is extremely serious. Research has found that diets high in canavanine, an amino acid found in alfalfa, can aggravate the disease lupus. However, canavanine is usually only found in the seeds and sprouts of alfalfa but not in mature leaves. Thus, alfalfa tea and capsules made from leaves are not expected to contain canavanine. Nevertheless, it is recommended that alfalfa be avoided during pregnancy because of its potential canavanine content and hormonally active saponins. If you are pregnant, it is recommended that you avoid regular daily consumption of alfalfa or its supplements. Alfalfa is available in capsules, which you may take daily as a nutritional supplement. One or two capsules a day is recommended. You can also find bulk alfalfa leaves or seeds at some health food stores which are great for making a nourishing tea. Find out how to prevent this painful condition from developing. ^ Mölgaard J, von Schenck H, Olsson AG. Alfalfa seeds lower low density lipoprotein cholesterol and apolipoprotein B concentrations in patients with type II hyperlipoproteinemia. Atherosclerosis. 1987 May;65(1-2):173-9. ^ Esmaiel Amraie, Masome Khosravi Farsani, et al. The effects of aqueous extract of alfalfa on blood glucose and lipids in alloxan-induced diabetic rats. Interv Med Appl Sci. 2015 Sep; 7(3): 124–128. Is this plant good for ITP (Idiopathic Thrombocytopenic Purpura) disease? Could you put up its photo? Very good health information! Thanks. Enochered, how old is the child? Fresh Alfalfa is safe for children over the age of one. I have been using alfalfa sprouts and seeds for many years and I do not appear to have suffered from any side affects whatsoever. I visited your site today because the child of a friend is anemic and I was wondering whether the Iron content of alfalfa would be a good remedy? Celeste LaBelle, Often the package of the medicine suggests the dosage and the duration the herb can consumed for. Usually 6- 8 weeks (about 2 months) is considered long term use. However, it depends on the interactions and side effects of the individual herbal medicine and is decided at your healthcare provider's discretion. I suffer from early satiety. Does anyone know if Alfalfa helps with this? Thank you! What is considered long term? Can I take it 2 times a day like a daily vitamin? It is very informative article for maintaining a good health especially in old age. I am seventy one now. How many calories are in plain alfalfa seeds not the sprouted alfalfa? My husband and I take alfalfa leaf powder from GNC. We love it. It helps him with his back pain and I take it in place of my vitamins. Everyone we recommended it to is using it, and loves it!